1. Incorrect VOIP Line Password (Note: Password is case sensitive). 2. Auth Name mismatch with Username (Auth name must be either blank or exactly same as your VOIP Line username and is case sensitive). 3. Not registering your VOIP Line from the “Permitted IP or Range” as saved by you. 4. Registering the VOIP Line, which is not supposed to be registered, as it is set by you to send inbound calls to your Static IP. If your IP Address is banned for any of the above reasons or for any other reason, you will be immediately notified by e-mail that includes what exactly the problem is and how to overcome it. Please pay attention to the contents of these e-mails as it will contain valuable information on how to overcome the problem that is causing this issue. Similarly when your IP Address gets automatically unbanned at the end of the 20 minutes interval, you will receive another e-mail informing you of this unban action. If you do not want to wait for 20 minutes for the IP Address to be unbanned, you can manually unban it immediately. Please refer to this blog article on how to manually Unban your IP address. 1. Just in case you do not want to receive these E-mail alerts, you can unsubscribe from these e-mails. 2. If you want to receive these e-mail alerts on a different e-mail id, you can change the E-mail id in your DoorVaani account. Please Note: Before you take any action, please ensure that the IP Address shown in the E-mail you received is really your IP Address. You can see what your IP Address is, by going to a service like www.WhatIsMyIP.com. If the banned IP address is not your IP Address, it indicates someone else is trying to misuse your account or steal your credit. Please contact us immediately if this is the case so that we can help you secure your account. The rest of this blog post explains how to set up your e-mail preferences. How to unsubscribe from these E-mail alerts? 1. Login into your DoorVaani account. 2. Go to “VOIP Line Details” page, by clicking on your VOIP Line username in the “My VOIP Lines” page. 3. Locate the “Send IP Address Bannned/Unbanned emails:” section at the bottom of the “VOIP Line Details” page. 4. Uncheck the “Send IP Address Banned/Unbanned emails” check box and submit the page. How to change the E-mail ID for these alerts? 4. Check the check box, enter your desired E-mail ID in the input box labeled “Email ID for IP Address Banned/Unbanned” below the check box and submit the page. Please refer to the images above for the full details. If your IP Address is banned for any of the above reasons or for any other reason, you will be immediately notified by e-mail that includes what exactly the problem is and how to overcome it. Please pay attention to the contents of these e-mails as it will contain valuable information on how to overcome the problem that is causing this issue. Similarly when your IP Address gets automatically unbanned at the end of the 20 minutes interval, you will receive another e-mail informing you of this unban action. You may want to unsubscribe from these e-mail alerts or you may want to change the e-mail id for these alerts. Please refer to this blog article on how to unsubscribe or change E-mail id. If you do not want to wait for 20 minutes for the IP Address to be automatically unbanned, you can manually unban it immediately. The rest of this blog post explains how to manually unban your IP Address. How to manually unban your IP Address? 3. In the top of the “VOIP Line Details” page, you can see your VOIP Status showing you the IP address status. You will also see a link “Please click here to unban this IP now”. Please click on this link and your IP Address will be unbanned and access to our server will be opened. Please Note: You must correct the problem that caused the IP address ban before you manually unban your IP address. Unless you correct the problem your IP address will get banned again. In your DoorVaani account, you can set your static IP address on which you want to receive inbound calls destined to your VOIP Line. This is known as IP Authentication. If you are using IP Authentication, you are not supposed to register your VOIP Line to our server. 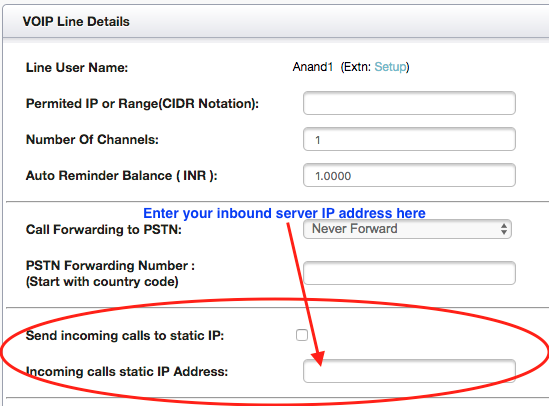 How to set IP Authentication (Static IP Address for inbound calls)? 2. In your VOIP Lines page, please click on your VOIP Line username to be taken to the “VOIP Line Details” page. 3. Locate the “Send incoming calls to static IP” check box and input box in “VOIP Line Details” page and check the box ON and enter your static IP on which you want to receive your inbound calls. Set static IP to received inbound calls. 4. Submit the page to save your updates. How to remove IP Authentication? If you want to remove IP Authentication, please revisit this page and uncheck the check-box and remove the IP address and save this page with a blank in this field. You can protect your DoorVaani VOIP Line from misuse by setting it to be registered only from your static IP or a range of static IP addresses written in CIDR Notation. Once a “Permitted IP / Range” is set for a VOIP Line it can be registered only from that IP address or that range of IP addresses. How to set permitted IP / Range? 3. 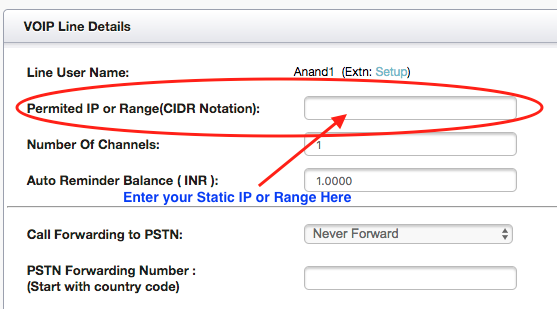 Locate the “Permitted IP or Range(CIDR Notation)” input box in the top of the “VOIP Line Details” page and enter your static IP or Range of IP addresses in CIDR Notation. How to unset permitted IP / Range? If you want your VOIP Line to be registered from any IP Address, please revisit this page and remove the Permitted IP address / Range and save this page with a blank in this field.